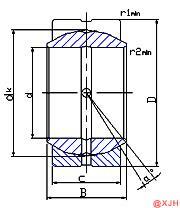 The SPB GEF.ES Series is a so-called flat bearing that is simple in form and has a large contact area. If the lubrication is good, the wear resistance will be good and the bearing life will be long. The sliding bearing has a large bearing capacity, high rotation precision, and the lubricating film has an impact resistance. The SPB GEF.ES Series is a so-called flat bearing that is simple in form and has a large contact area. If the lubrication is good, the wear resistance will be good and the bearing life will be long. The sliding bearing has a large bearing capacity, high rotation precision, and the lubricating film has an impact resistance. Therefore, it is widely used in engineering. 1. The oil film can smoothly enter the friction surface. 2. The oil should enter the bearing from the non-bearing surface area. 3. Do not open the full ring oil groove in the middle of the bearing. 4. Such as oil tiles, open the oil groove at the seam. 5. To make the oil ring fully reliable. 6. Do not block the filler hole. 7. Do not form a zone where oil does not flow. 8. Prevent sharp edges and corners from cutting off the oil film.